The below Dementia Symptom Tips are excerpted from Jennifer’s FaceBook page, https://www.facebook.com/gloriousopportunity/. 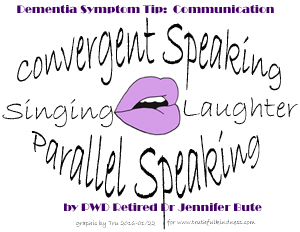 If someone with dementia is speaking in word salads or ‘gobbledegook’, it is sometimes possible to get them to talk sense by reflecting back the emotional content of their speech and reflecting back any intelligible words into your own conversation. We were in the village minibus going to see the spring flowers and X was excitedly talking in word salads. So I went to sit by her and excitedly started talking about crocuses and the blue sky…and every time I recognised a word she used, I included that in my speaking. Y asked me why we were having 2 different conversations, so I explained and told her to listen. X started making more and more sense and after about 10 mins she suddenly spoke a whole sentence that everyone could understand. If someone with dementia is finding it difficult to speak it can be very difficult if anyone with them faces them directly – it can cause them to ‘freeze’, but if one looks in a different direction it can sometimes enable them to join in. Whoops! I stopped and said, “Oh dear, that is not a good way to start is it!’ and we both ended up laughing so I turned and looked at the pictures on the wall and started making comments about them. After a while she suddenly said, “We bought that one in Hong Kong…” When her husband came back he was amazed, but had to believe me because I told him what she said! I mentioned last time about laughter. There has even been an article in the British Medical Journal about it’s benefits in dementia. It seems to open up access to further areas of the brain or enable more connections to be made. Last week I went to the village restaurant and joined Y, sitting by herself, who has progressing dementia. She attends my Japanese Memory Group, but some people find her challenging. I cannot remember exactly how it all started, but we both ended up in fits of laughter (we had some surprised glances!) and she then started telling me stories about her childhood that I had not heard before, in amazing clarity. There are several Youtube clips of people ‘coming alive’, being able to speak, after listening to recordings of their favourite music, for example, Henry. The ability to sing never seems to be lost. The clip of Gladys Wilson is very moving. Music seems to join up so many connections. I run twice weekly memory groups in the dementia friendly village where I live. We always start with singing a familiar song. I discovered that when Q joined in the singing she could also join in the reading aloud of a familiar poem straight afterwards, and sometimes read aloud by herself, which amazed me as she was usually mute. Recent research also indicates that in dementia, joining in with the singing is what is important, not just the listening.